“When the red moon rises over the heart of the Okefenokee swamp, legend says that the mysterious golden gator Munch will grant good luck to the poor soul foolish enough to face him. Every few years, I come across a book that leaps into my list of favorite books. I will proclaim my love for these books to anyone who will listen. Tumble and Blue is that type of book. First, let me talk a bit about much I enjoyed the actual writing in this book. I found myself repeatedly grinning from ear to ear at the beautiful prose. Now, I’m not saying it was flowery or gushy or showy. It was just a joy to read because of how well it was crafted. I knew after the first chapter that I wanted to slow down a bit and really enjoy the book. Cassie Beasley’s pacing was great throughout. I never felt like the story got bogged down (pun intended.) She did an excellent job at giving the reader just enough information to move the story forward, but left parts a mystery to be discovered later. And I loved Tumble and Blue. Both of these characters were vivid and fleshed out. Their problems were real, heartbreaking problems that most kids could empathize with. I also enjoyed all entire Montgomery clan and their crazy mishaps. 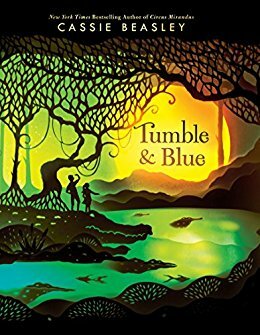 One of the best parts about Tumble and Blue is that the emphasis of the magical realism is really on the realism part. Beasley doesn’t rely on the fantastical parts of the story to dazzle and wow the reader. Instead, she is able to make everyday life in rural Georgia jump of the page. Tumble and Blue was truly a delight to read.